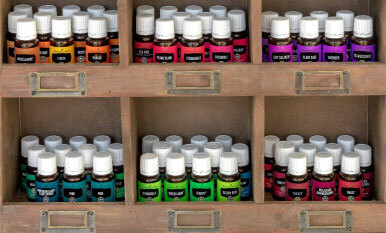 Start by choosing your favorite essential oil whose aroma will set the mood for your practice. 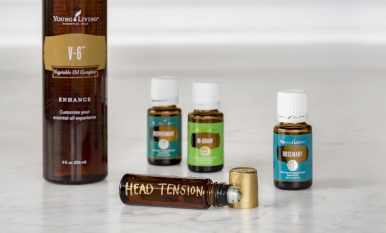 For a calming aromatic influence, try the Young Living blends Stress Away™, Grounding™, or Peace & Calming™. Sweet, woody singles such as Cedarwood or Idaho Blue Spruce are also great choices. If you need an uplifting aroma, try using blends such as Clarity™ or Transformation™. Benefits: Calming and centering. Brings you into present time. Note: During any of the following exercises, freely reapply the essential oil into your palms. Place a few essential oil drops into your left palm, rub your palms together gently three times, and bring your cupped palms close to your nose. Inhale deeply for three counts, pausing at the top of your inhalation. Imagine essential oil molecules entering your brain, the center of your head, and your lungs. Focus on your breathing. Exhale for three counts and bring your palms down to your lap. Benefits: May help encourage mental relaxation. Ideal for practicing while seated in front of a computer. Sitting at the front edge of the chair, place your feet on the floor at hip width. Make sure your ankles are aligned directly beneath your knees and your toes are pointing straight ahead. Elongate your spine by pressing down through your feet while simultaneously lifting your breastbone and the crown of your head toward the ceiling. Roll your shoulders up and back and release your shoulder blades down. Your lower back should not be overarched. Focus on your breathing as the air travels down into your belly and back up toward your head. Benefits: Creates a sense of stability. Strengthens and tones the thighs and buttocks. Creates heat in the body. Strengthens and opens the shoulder girdle. Slide your feet back a few inches, hold onto the sides of the chair, and lean slightly forward. Inhale and raise your arms toward the ceiling. As you exhale, press down firmly through your heels, lifting your seat 2 inches off the chair. Pause. 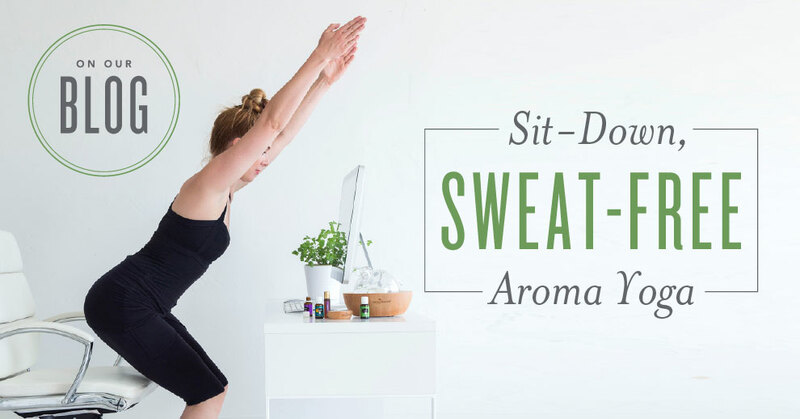 Inhale and very slowly sit back down, and then lower your arms as you exhale. Repeat this sequence 8–10 times. Benefits: Opens the back of the neck and spine. Calms the nervous system. Creates a cooling and calming effect for the body and mind. Note: After each of the following exercises, repeat the Forward Bend to release your back and neutralize your spine. Slide your thumbs into the hip creases at the top of your thighs, where your thighs meet your hips. As you inhale, press down through your feet and hands and elongate your spine. As you exhale, draw your belly in toward your spine and lean forward. Tuck your chin to release your neck, allowing your upper back to round at the end of your movement. Let your arms hang, staying in the pose for a few breaths. During the stay, as you inhale, lift your chest slightly and elongate your spine. Exhale and allow your spine to release. To come out of the pose, slowly roll up through your spine, stacking your vertebrae from the base of your spine, with your head lifting last. Benefits: Stretches the belly, torso, and underarms. May help invigorate the senses. While in the Seated Mountain pose, inhale and circle your arms out to the sides and up to the ceiling. As you exhale, circle your arms back down to your sides. Repeat three times. Raise your arms above your head, interlink your fingers, and flip your palms to face the ceiling. Stay for three breaths. While you inhale, press down through your feet, elongate your spine, straighten your elbows, and press your palms toward the ceiling. Exhale, allowing your elbows to bend and your spine to relax. Repeat three times. Lower your arms back down to your sides. Benefits: Loosens and lengthens the spine. Improves the circulation to the discs between the vertebrae. Massages abdominal organs. Sit on the front edge of the chair and place your hands on your knees. As you inhale, press down through your feet and pull back on your knees. Lift up through your chest—allowing your back to arch—and lift your gaze to extend your spine more fully. As you exhale, bring your gaze down and draw your belly in toward your spine. Tuck your chin toward your chest and gently curl inward, allowing your spine to round. Repeat for five cycles. Note: Though these movements could be easy for some, please take precaution and do not strain your body or move beyond your capacity. In this pose, build awareness of stuck and tense areas of your back and bring your attention, breath, and movement to those areas. Benefits: May relieve lower back pressure. Stimulates internal organs. Releases tension around spine. Sit facing forward in the chair. Place your heels beneath your knees at hip width, with toes pointing straight ahead. As you inhale, press down through your feet, raise your arms forward and up, and elongate through all four sides of your torso. As you exhale, draw your belly toward your spine and rotate left, turning your belly and chest to face the left. Lower your arms and hold onto the left armrest of the chair. 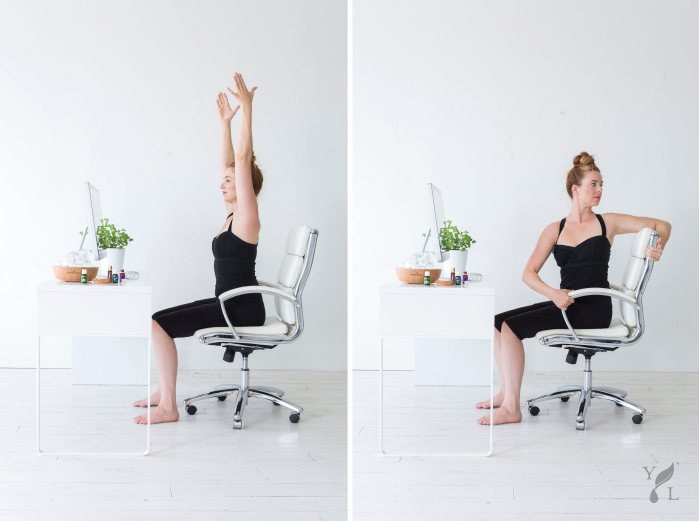 Inhale and pull on the armrest to elongate up through your spine. Exhale and twist by rotating your torso’s left side back and your torso’s right side forward. Include the rotation of your head so that you are gazing over your left shoulder. Stay in the twist for three breaths. 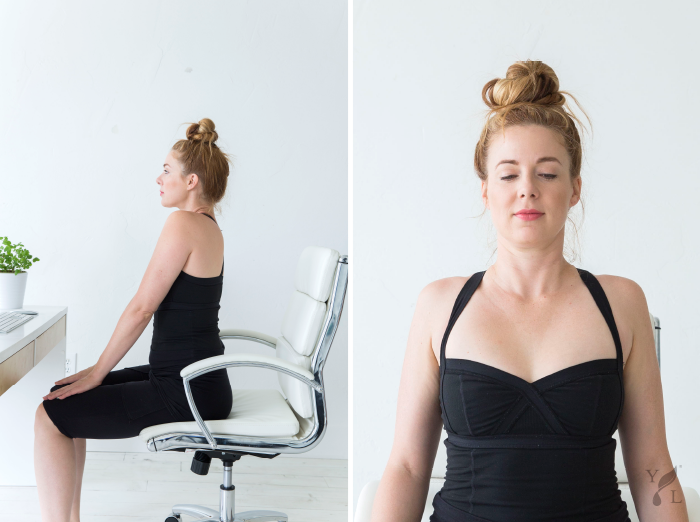 After three complete breaths, let go of the chair, face forward, pause, and breathe. Repeat, turning to the right side instead. At the end of this practice, bring your hands to the center of your lap, with the back of your left hand gently resting in your right palm. Close your eyes and notice your physical sensations and feelings. How are some of the ways you keep moving throughout the day? Let us know your on-the-go fitness and relaxation tips in the comments!